In CIAA basketball, Bowie State men and women went from hunting for first place to consecutive losses at home. Will Saturday’s game help or hurt? 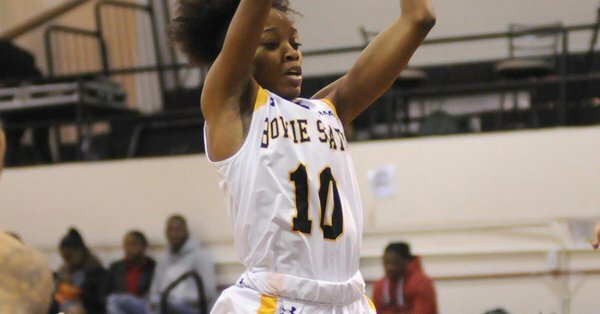 Bowie State men’s and women’s teams were on respective win streaks until CIAA North play opened up. Lincoln visited A.C Jordan Arena on January 19 and ended the women’s 14-game run. Virginia Union visited that following Wednesday afternoon and swept the men and women, ending the men’s six-game win streak. Both teams recollected and were successful on the road against Chowan last Saturday. When Virginia State came to town, however, BSU suffered another home sweep. The men and women are now both 1-3 in division play and fourth place in the north. BSU will have a chance to bounce back from its recent two-game losing streak at home on Saturday against Elizabeth City State. The Lady Bulldogs (16-4, 8-3, 1-3) are winless in division play at home and will host third seed Lady Vikings (13-9, 5-6, 2-2). ECSU is visiting with the second-highest scoring offense in the conference, averaging 71.6 points per game. BSU, however, has the top defense in the conference, averaging 49.5 points allowed per game. Both teams are coming off of heartbreaking division losses and cannot afford to drop another. Following the women’s game, the BSU men (12-10, 8-3, 1-3) will face-off against ECSU (11-11, 7-4, 1-3) in a fight for a second division win. The Vikings got their first division win on Wednesday against defending champ Virginia Union. TyJhai Bowers of ECSU leads the CIAA averaging 2.5 blocked shots a game. The Bulldogs are rebounding off a 17-point home division loss to nationally ranked Virginia State. Saiquan Jamison of BSU leads the conference in offensive and defensive rebounds, averaging 11.3 total per game. The doubleheader tip-off is begins at 2 PM at Bowie State University in A.C Jordan Arena. Back to women’s hoops. South division top seed Winston-Salem State (11-9, 7-3, 4-1) will host fourth seed Livingstone (6-15, 3-8, 3-2) on Saturday afternoon. Amaya Tucker leads WSSU averaging 15.9 points-per-game, fourth in the conference. Looking at records you expect this to be an easy win for WSSU, but don’t be fooled. LC has won three consecutive and turned its division play around from 0-2 to 3-2. Dasia Harris of the Lady Blue Bears leads the conference averaging 2.7 steals-per-game, collecting seven in their last three games. Don’t count them out for a second. Tip-off is at 2 PM in C.E Gaines Center at Winston-Salem State University. In men’s action on Saturday, Virginia Union (11-7, 7-3, 2-2) will host Chowan (12-6, 5-5, 2-2). Though CU has the better overall record, conference records place VUU at the second seed and CU at third in the northern division. Union’s Terrell Leach has been the consecutive scoring leader with 71 total points through the last three games. Chowan is coming to town with two top-ten conference scorers. Timothy Bing is fourth in the CIAA averaging 17.3 points-per-game and Demetrius Sanders is tenth averaging 15.5. This match-up should be competitive, entertaining and high-scoring. The men are set to tip-off at 4 PM in Barco-Stevens Hall at Virginia Union University. All games will be streamed live on the CIAA Sports Network.